Being an innovator in technology and business I focus on product, environmental and system innovations. Over the past few years, I have found myself pulling more and more inspiration from my passion for the natural world, biology, and ecological solutions. I have spent a great deal of time researching more about natural history, scientific theory and discoveries to inform my professional decisions in technology and business. I now firmly believe patterns have formed and have existed for thousands if not millions of years which elegantly solve most if not all the challenges we see in business today. A lot can be learned and applied from this domain to avoid reinventing the wheel and to draw upon new and inspirational innovations whether it be system, virtual and physical form. Exploring my passion further, over the past few weeks I have had the privilege of seeing Katrina Van Grouw presenting twice celebrating her latest publication release and Darwinian tribute ‘Unnatural Selection — evolution at the hand of man’, which is easily the most beautiful book I own and highly recommend. Her first presentation was at the historic Linnean Society and the second at the Royal Institution of Great Britain, which were apt environments steeped in evolutionary history and scientific discovery. During the presentation which covered just some of the findings and arguments proposed in her new book, some key points resonated with me. Challenges that we encounter regularly in innovation whether these are restrictions are due to the inept structure and form of organisations and systems, or the observable demise of companies subjected to radical environmental changes, are similar to those of the natural world. This is where more attention and learning could be had on how Natural and Unnatural selection as a systemic approach to design could lead to improved outcomes for businesses longevity and prosperity. It may well be that sitting next to us on this unknown journey of prosperity and success are a thousand potential solutions and advantages. If we consider that products are themselves a consequence of organisational culture and it’s intent to succeed in a hostile ever-changing environment, then objective design could improve our chances of success. By objective design in this context, I mean designing the system of business to innovate by many small, but deliberate changes and differences to better survive and succeed in variable environments where change is constant and competitors are somewhat predatory. Exploring this further I have extracted a few notable arguments which were triggered by Katrina Van Grouw’s book and presentation which I feel resonated with some of my own common observations in business and technology. 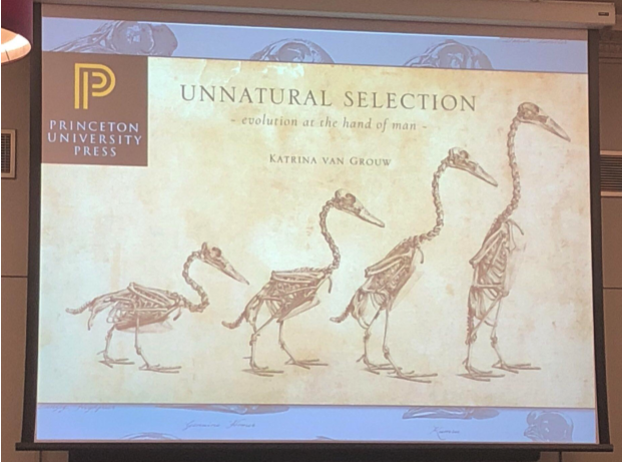 Katrina passionately challenged the old evolutionary statement of ‘Survival Of The Fittest’, stating this is one of the most grossly inaccurate and misunderstood phrases in the scientific world. Survival in this context simply meaning that one must exist for a period of time and that in itself is not enough to be defined as success. This phrase which is commonly attributed to Darwinian theory, but was first coined by Herbert Spencer in 1864 in his publication of Principles Of Biology in reference to Darwin’s origin of species has certainly done its rounds in the business management world. There is a lot wrong with this statement and it’s grossly misunderstood in both the natural world and the world of business. In later editions of Origin of The Species, Darwin linked Natural Selection and Survival Of The Fittest to being “better adapted for the immediate, local environment”, not the common modern meaning of “in the best physical shape”. Similarly, in the business world, this dominant definition has been challenged as being archaic and inept for a globalized economy which has seen many of the largest by definition ‘fittest’ companies fall from grace. “Reproductive success for individuals best fitted to their environment”. I believe this suggests that continuous evolutionary difference and form, through reproduction, yielding the best fitting design for the environment at that given time, is the pattern of evolutionary success. In fact, this was followed with the bold statement, failure to reproduce to the above is failure itself. Exploring the definition of survival success further it’s worth considering such a success also depends upon diversity. If we look at a single pattern or design whether in the natural world or that of business it’s dominance is considered temporary and somewhat dangerous for survival. In business, we tend to consider products as the individual Species but should consider diversity in the portfolio to be more like the Genus. Consider specialist island species such as the Kiwi, a flightless bird native to New Zealand. These birds which are believed to have ancestors who were able to fly when they first reached the islands, evolved to best fit their environment. With no indigenous ground predators, they were able to lose their wings without consequence and reduce the energy investment in their creation and maintenance, to evolve and improve other senses and traits to succeed. This has worked well for a long period of time until explorers inadvertently and instantly introduced predators such as cats and rats which have now contributed to it’s vulnerable status today. Similarly, in business, the once dominant Kodak met its demise when it failed to react to the environmental change of digital photography having heavily bet the company on film-based technologies. If Kodak had spread its portfolio to be more diverse and had an improved propensity to respond to environmental changes in a deliberate and similar fashion to proponents of natural selection, it may have survived. Yes, the specific affected Species/Product may have died, but the Genus/Portfolio would have survived and other Species/Products within. Moreover, the dying product could have better informed or revealed weaknesses and thus opportunities of strength for its successors. This brings us back to “Reproductive success for individuals best fitted to their environment” and we could add to this the benefit of reproductive speed. Reflecting on the above, a question arises in the natural world and world of business which is around the hand of Unnatural selection. As with the domestication of animals has seen how potent selective breeding can accelerate evolutionary design traits (especially considering agriculture); creating many derivative traits and therefore new species can improve the chances of success and survival. Stated by Katrina Van Grouw, it’s commonly expressed that people believe domestic species are deemed unfit because they wouldn’t survive alone in the wild, but in a world dominated by Man. Surely considering the clear dominant species is Man though, is that a bad thing? It’s far more likely that dogs will outlive wolves as a result so the Unnatural selective process of breeding dogs to better fit Mans world, therefore, improving the chance of success for the Genus and Species. Taking this back to management, by applying some of the conscious practices of unnatural selection in the domestication of species, innovation would be more deliberate and would accelerate design. Moreover, if we could depart further from the mythical notion of Survival Of The Fittest which suggests benefits by size, mass and power alone. The domestication of species through unnatural selection has without a doubt accelerated the observation of evolutionary design. In some cases such as agriculture and farming, much of this design has been deliberate in the sense that selective breeding was aimed to improve certain traits. Such traits to yield more wool or meat has changed the biological properties of a species in many cases forming new species in the process. These traits have protected the species further, resulting in significant human investment to nurture and protect the species for these desired yields. Conversely, if you consider unnatural selection or selective breeding for other needs such as passionate curiosities and not yields, such as those exhibited by pigeon fanciers, these have produced equally accelerated and diverse results. These results have created genetic properties which were not sought, but when observed have been maintained and exploited further by these keepers and pioneers. This is not too different from some of the most significant discoveries and products in science including Viagra and Penicillin to name but a few. In a reflection of the observations above, innovation management can be applied following a similar approach. If we consider that unnatural selection is product development and change, then selective breeders seek properties to improve yields. Companies seek to incrementally or adjacently innovate to improve market share or revenue by applying the same or less effort. Taking existing products and refining areas to improve yield could produce higher value rewards for effort. However, I believe selective breeders don’t structure their approach in such a linear and administrative way that companies do but do have a goal orientated drive and outcome approach, supported by a highly experimental and observational state. Where selective breeding is more exploratory and observational until desired properties are noticed through inheritance such as domestication, corporate innovation could benefit immensely. For instance, when Pigeon fanciers observe a new desired physical difference or trait, they attempt to exploit the trait through selective breeding inheritance to exaggerate that trait. How many times in your organisations do you recall observing a potential positive trait and have the ability to replicate or accelerate it across the organisation ? These breeders are highly in tune with these changes and seek differences and presumably consciously and aggressively removing risks from their process and improving positive contributions, including maximizing and minimising the environmental impacts. Some similar attempts have been made in the world of Lean management, but are still confined by efficiency benefits alone over the potential diversity of new business models, products and services. The companies of tomorrow are those today which recognise that the key to survival or better put future success is dependent on continuous innovation. This realisation could improve their likelihood by accelerating innovation through similar approach observed by both Unnatural selection and the Natural selection process. Companies should better proportion investment and efforts in deliberately designing new generations of solutions which will be heavily influenced by the natural selection process such as consumer choice and technology trend shifts. They should also significantly seek to diversify portfolios, improve products to expand the range of solutions offered today and invest and train their employees to be highly observant of the potential of new opportunities. When such is observed then be in a position to exploit these observations and as quickly as possible. Just like the Kiwi, where companies bet on a single design although, in a stable and dominant environment, they will not be able to react to environmental shifts which are inevitable which could lead to their extinction. The biggest risk of all is to believe that a successful design today is all you need to survive tomorrow. By having a diverse Genus or product portfolio with a range of business models, there is a significantly improved chance of future success and growth for companies. Author Ask : I hope to explore more parallels between the natural world with technology and business. This is one of my first attempts at combining my personal interests in Natural History and professional interests in Business, Technology, and Innovation. I would really appreciate feedback on whether you think this post was of interest or not and whether you would like me to explore this route further and found the article useful. Please post comments below.